With the first week of the EU LCS behind us, what have we learned after watching ten teams duke it out on the Rift? Well, not a lot, essentially. We got a good read on how strong each team is and how they’re adapting to the evolving meta, but before we go deeper on each and every team, let’s focus a bit more on what’s meta right now. A lot of games were played and we’ve seen a plethora of fascinating picks and team compositions however nothing is really set in stone. It became evident that almost every single pick and every single strategy has a high chance to work. On one hand this is the most exciting the LCS has been in quite some time, but there isn’t always a method behind the chaos and the frantic action. While it’s refreshing to see a pick like Darius in the bottom lane, it’s also crushing to see staple veteran AD players like Rekkles be relegated to Janna or Karma duty. They’re being forced into playing champions that have relatively low skill ceilings and they’re not able to fully flex their mechanical prowess. So while it is engaging to watch, it’s a bit too chaotic. Over the last week, we’ve seen teams try their hand at the meta and certain rosters did better than others. It’s obvious that some teams revel in the chaos while others are just plain lost. It’s a rough time in general as everything got turned on it’s head but there were still a couple of teams that emerged as clear cut winners. G2 eSports and Vitality in particular showed a fantastic understanding of the meta whereas others like Fnatic are still trying to figure out what’s the best and most optimal way to play the game. For betting, this is essentially the absolute worst case scenario. You don’t have a clear idea on whom to bet on in general as anything can happen at any given time. For our first match of the day we have a fairly unexciting clash between Giants and the Unicorns of Love. Now overall, neither of these two teams are world beaters right now by any stretch of the imagination. They have a pretty solid read on the meta but nothing too extraordinary. Giants were really hot and cold last week and not just because they ended 1-1. They played some solid League of Legends against H2K but things got very strange very quickly. After a complex teamfight ensued in the mid lane, Betsy decided to completely abandon his team and go for a quick push as Azir. Fortunately, due to a lot of attack speed and ability power, he was able to brute force through the mid lane and essentially back door. Against Vitality on the other hand they failed to put up much of an offensive. Because of this, it’s still too early to give them any benefit of the doubt after just a single week of play. The Unicorns on the other hand showed some signs of live overall. They displayed a very strong early game and some very solid team cohesion. They were leading against Schalke for the majority of their game however they were out of sync when it mattered the most and Schalke’s late game potential took over. Their game against Misfits however was a lot worse, so essentially they’re sitting in the exact same position like Giants. Some good signs but overall too early to give a verdict. We’re going with the Unicorns on this one but in reality it can really go either way. You can argue that Vitality is one of the rare teams in the region that completely revels in the current meta. They have the flexible players and the mentality to go for any pick, team comp and strategy that’s available and because of this they’re a very formidable opponent. Fortunately for all Vitality fans, they shouldn’t be tested too much by ROCCAT. They’re simply too fast, too cohesive and they’re not afraid to experiment. Attila (formerly Minitroupax) in particular played both Ziggs and Lux to perfection and even though he’s an AD main you can only imagine what he has in his pockets. They have a chip on their shoulder after losing to Splyce in the semifinals and they want to go to Worlds. As for ROCCAT, they displayed some clean gameplay last week. They were on point in their teamwork and macro overall and Memento remains their biggest catalyst. That’s not a problem though as he’s a consistent performer when it matters the most. While they did fumble against G2 you can’t really blame them as the former kings of Europe are currently playing the best League of Legends in the region. Betting on Team Vitality would be the better and more logical choice, even though ROCCAT has the tools to make this into a highly competitive scrap. We’ve come to the match of the week. G2 eSports are currently performing like the best team in the region – by far. Their two games were an absolute masterclass in every way, shape and form and by the looks of it they won’t stop any time soon. They’re hungry, they want to retain their throne and they’re on the right path for sure. They’re so adept at the current meta and they’re fully utilizing their strengths in every way imaginable. Wunder – who is one of the more capable top laners in the region is finally on carries and bruisers, Perkz is almost always sensational when it matters the most and their bottom lane is finally able to carry their own part of the weight with picks like Heimerdinger and a plethora of different supports. Schalke on the other hand continued their hot and cold streak from the Spring Split. They did some things well and others not so well. In short – it was a confusing performance to say the least. You could see their potential but also the fact that they’re far from reaching it. They have a questionable early game in general and even though they were losing for the majority of the game against the Unicorns of Love, they managed to rebound as the game went on. Their game against Fnatic was the exact opposite. They dominated early on and they succeeded in shutting down Caps from the very get go. However even though they had a huge gold lead for the majority of the game, they let a Baron slip through for Fnatic and then they essentially shut down within a couple of minutes and just flat out lost the game. It was confusing and a sign of indecision, to say the least. We’re going with G2 on this one and with good reason. They’re simply too strong right now with the meta changes and everything, and if they survive the early game without making any cardinal mistakes they should be able to close out the game without much trouble. Even though Fnatic started off the Summer Split with a 1-1 score overall – which isn’t that bad, their level of play was nothing short of abysmal. They tried essentially the same team comp twice last week and they succeeded once – arguably. They’re not tryharding, they’re testing their limits and testing things out – and that’s highly commendable. They know they’re one of the best teams in the world and that just brute forcing things in the first couple of weeks won’t allow them to develop and prosper in the long run. As for H2K, they failed to do much in both of their games. They were outclassed by Giants in the second game of the split and their game against ROCCAT wasn’t much better. Their drafts aren’t that good and it just seems like they’re not at home with the meta. To make matters even more complicated, they’re putting Sheriff on picks like Karma so they’re essentially losing their primary carry. Sheriff had some of the best damage stats out of all ADC last split and not having him on late game hypercarries will seriously hinder H2K’s chances, regardless of the opponent. We’re going with Fnatic, but it could be a confusing game overall. With Fnatic’s latest drafting choices, they’re not an easy team to predict and they might not want to tryhard when you’d expect. That said, they have the tools to come back into the game and emerge victorious even if they don’t start as well. The last game of the day is quite the exciting one. Splyce didn’t start off the Summer Split as well as they had hoped. They lost both of their games against Vitality and G2 and while that’s not such a big shock, their play was far from perfect. They have a solid read on the meta but it seemed like they were playing certain picks and team comps not because they wanted to but because they had to. With time they’re going to improve and be a solid threat overall, but that time isn’t right now. As for Misfits, they’re looking like a Top 3 team for sure. Their flexibility and deep champion pools were on full display last week. Their play and drafting was on point and it was a delight to watch. They always had a fantastic early game but they were often outscaled and out-teamfought in Spring. If they manage to fix their late game shotcalling they have a very concrete chance of reaching the very top. Giants were unable to build on their win from last week against the Unicorns of Love. While they did make a couple of solid moves on the Rift, they were slower and less proactive than the boys in pink from start to finish. The Unicorns were always faster on the map and were focused on taking down objectives rather than going for quick trades. Giants continue to be a middle-of-the-pack team with some solid potential, but right now it seems like they’re trending more towards the bottom of the standings. They have a pretty good read on the meta but they’re just not playing that well as a five-man unit. Misfits on the other hand remain one of the best teams in the region. They’re one of the few teams that are still playing standard team comps and with a top tier AD like Hans Sama you can see why. They’re so cohesive and aggressive as a team and perhaps most surprisingly – Sencux has been stepping up considerably. His Irelia yesterday was a thing of beauty. They’re finally coming into their full form and right in time for Worlds. If they continue this level of play throughout the next couple of weeks then we could be in store for a very exciting finish of the Summer Split. We’re going with Misfits on this one and with full confidence. For our third match of the day we have a fairly unexciting clash between the former kings of Europe and H2K. G2 continued their incredible run yesterday after demolishing Schalke 04. It wasn’t clean early on but once Perkz got online as Kai’Sa – which wasn’t too hard seeing how he was protected by Karma, Braum and Tahm Kench – it was game over for Schalke. He was so strong in fact that he was able to score both a quadra and a pentakill. G2 aren’t just winning games – they’re dominating, and it’s a refreshing change of pace for the former four time champions. H2K on the other hand were on the receiving end of a very game Fnatic yesterday. They were completely outclassed on almost all fronts from start to finish. They weren’t really able to do much and the game was over even before the thirty minute mark. It wasn’t a promising sign for H2K but at the same time they were up against one of the best teams in the region so the outcome was somewhat expected. G2 shouldn’t have any trouble taking H2K down, regardless of the team comp they go for. Splyce are simply trying too much. They’re experimenting and it’s not working – with Nisqy going with Camille and KaSing with Zoe in the bottom lane. Odoamne is still spending the majority of his time on tank duty and while he isn’t a bad tank player, they’re not utilizing his full potential. While they didn’t exactly roll over and surrender against Misfits yesterday, their play really didn’t inspire any kind of confidence. Are they a good team? Absolutely. Do they have a lot of potential? For sure – but they’re not reaching it right now and the problems that they have aren’t really solvable in a week’s time. We’re going with the Unicorns of Love on this one, but not will full confidence. While they’re far from a top tier team, they showed more over the last two weeks. They were more in-sync, they displayed a better understanding of the meta, not to mention their drafting versatility. That said, things got a bit heated in the mid game and they could have lost as well if it wasn’t for an insane Baron steal from Kold. With Baron in their possession, they managed to ace Giants and close out the game. It wasn’t clean by any stretch of the imagination, but it was a win nonetheless. If they focus as come out full force against Splyce then they actually might have a solid chance of scoring quite a big upset. For our last match of the day we have a very exciting clash between Fnatic and Team Vitality. This is by no means an easy match to predict. Fnatic are the better team overall but how well they will perform remains a mystery. They’re willing to experiment with their shotcalling as well as drafting so you never really know what’s going to happen before the game begins. They completely outclassed H2K yesterday but then again they were up against a bottom tier team. 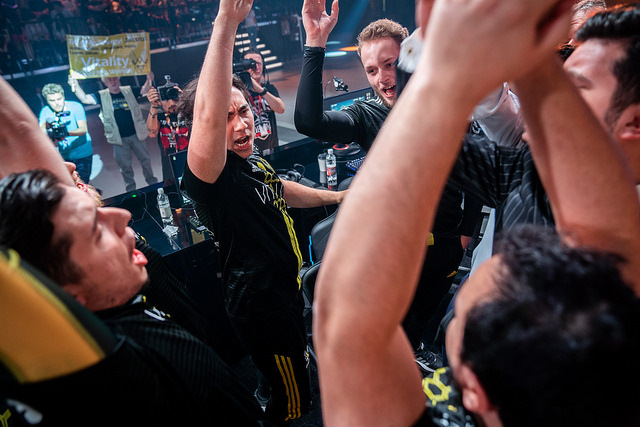 Vitality are a different kind of beast, and even though they haven’t been that consistent overall they’re still a force to be reckoned with. They were unable to best ROCCAT yesterday so they’re currently sitting at a pretty solid 2W-1L record. The beginning of the game was like a nightmarish scenario for Vitality as they gave up multiple kills in the mid lane. That quickly snowballed to a pretty solid gold lead. ROCCAT had the upper hand until Vitality took the reins once again. It was a hectic, back and forth game and we saw multiple throws. In the end, ROCCAT had more damage and a better late game team comp which was more than enough to secure the win. Vitality are a very dangerous team when they’re playing their best League of Legends. Unfortunately, we rarely know when that will be the case. Regardless, we’re going with Fnatic on this one. Their mental resilience and experience should be the determining factor – given that they don’t go for an illogical team comp like last week.